All chilli seedlings now potted into 9cm pots. 42 varieties plus 6 breeding lines, so if all goes well it should be an interesting trial. I was surprised to find that the first chilli to germinate was 7pot Primo which took just 6 days. I anticipated that as a super hot it would be slow, so it is in a module with known slow germinators. The best laid plans ....! More predictably, it was followed by several baccatum cultivars. 2019 Chilli trial sown and on heat bench. Hoping for an earlier start than last year as there is some very interesting new material to look at. And, of course, to taste. The article on lemongrass has been updated. I am growing East Indian lemongrass from seed this year. I am hoping to get a root of West Indian lemongrass from somwhere so that I can compare the two. In the mean time I have added an article on lemongrass, which will be expanded in due course. Finally got round to tasting Capsicum lanceolatum, and collecting some seed. The chillies were fleshy, showing no sign of drying on the plant. The flesh was unpleasantly bitter with no heat. As the plants were rather temperamental and slow growing, I will try to keep the overwintered plant alive, but other than that will not grow this species again. We held a very successful open day on the 11th with plenty of tasting opportunities. One friend brought a ripe 'Dragon's Breath' for us to try to see how it matched up to the hype. In terms of flavour and pungency it was just a standard naga, probably comfortably under a million SHUs. C. galapagoense is starting to ripen at last, and even C. lanceolatum has now got green chillies clearly visible. Have now tasted fresh chillies from C. eximium and C. annuum var glabriusculum. Hot, but not excessively so. C. galapagoense is still not ripe, and C. lanceolatum has not yet set a single fruit in spite of flowering steadily for the past two months. Everything growing well, and loads of fresh chillies to eat. Trying to analyse the different types of pungency found in different chillies. Is the heat immediate or delayed? Does the heat fade quickly or linger? Where in the mouth is the heat felt? Very pleased with the progress of a cross I made between two un-named C. frutescens accessions. Plants looking to be compact, early and productive. 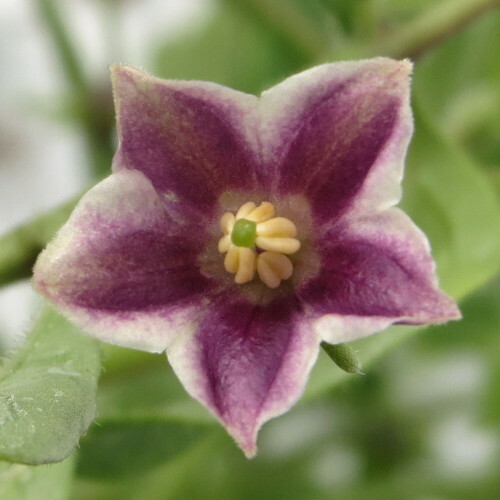 Capsicum lanceolatum plants still much smaller than any of the other species that I am growing, but opened first flower today. Two landraces of Capsicum annuum var glabriusculum both sown on 1st March: a dwarf Mexican chiltepin and a tall Guatamalan chiltepin. Now that the brief heat wave with glasshouse temperatures of 46°C has passed, it is interesting to look at its effect. All the cultivated chillies seemed to enjoy the extra heat, but the response of the wild species was more varied. 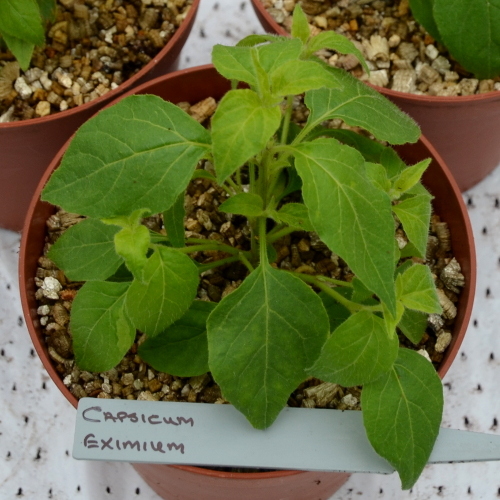 Capsicum annuum var glabriusculum obviously enjoyed the conditions, as did C. galapagoense and C. chacoense. C. lanceolatum, however, scorched badly and looks in very poor condition; perhaps not surprising in that this accession originated in the Guatamalan cloud forest. Clearly this species likes high temperatures, but needs shade from strong sunlight and higher humidity than I was able to maintain. C. eximium is not looking as healthy as I would like, but in this case the cause is not so obvious. Capsicum lanceolatum, which has looked rather delicate until now, has really enjoyed the recent very hot weather. Still in 9cm pots, but starting to grow more rapidly. The most advanced Capsicum galapagoense seedlings were showing root out of the bottom of their 9cm pots, so decided to pot them up. Compared to the other species I am growing, root development was very weak with only a few thin unbranched roots on each plant. Will be more patient with the remainder! First open chilli flower of the season, on overwintered Bolivian Rainbow. I am increasingly equivivocal about overwintering chilli plants as it creates an early season resevoir of pests and diseases, with aphids being the main problem at the moment. 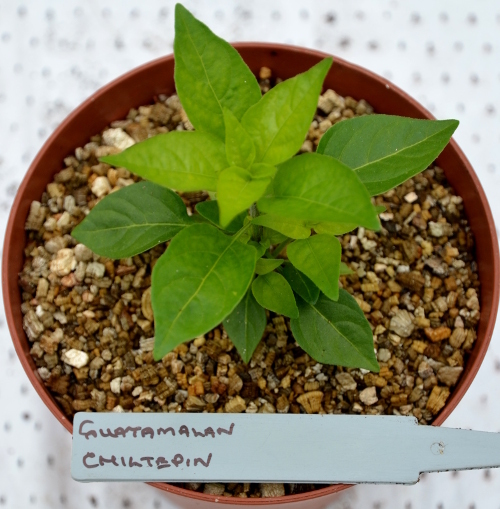 Young Guatamalan Chiltepin, Capsicum annuum var. glabriusculum, in 13 cm pot. Chilli trial all planted in glasshouse, and a selection potted up into 13cm pots. 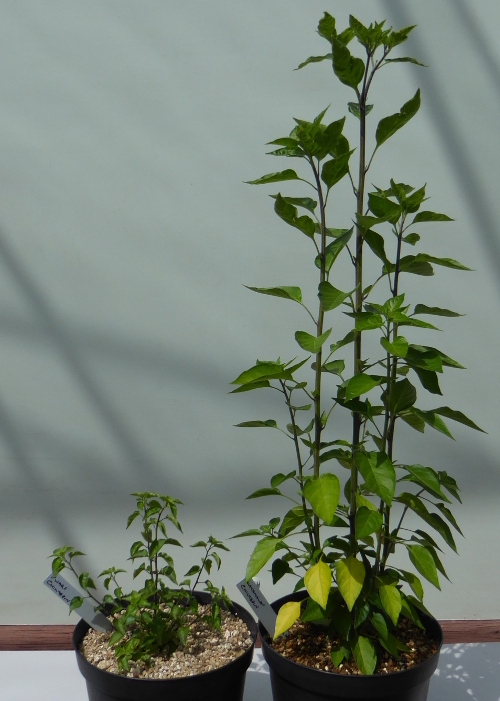 All the Capsicum species are growing well, and developing their individual characters. 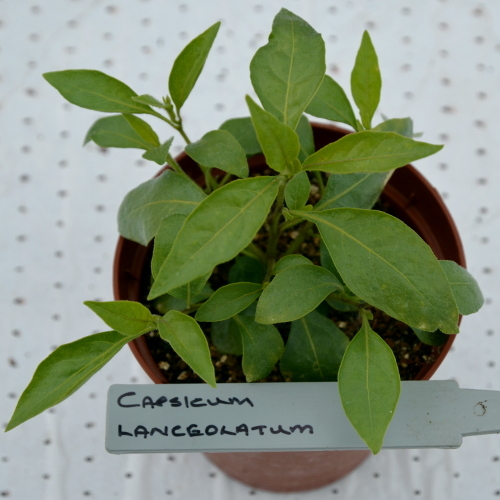 Capsicum eximium, now in a 13cm pot, is noticeably pubescent. C. lanceolatum seedlings looking healthy, but unlike any other chilli seedlings. Germination of the wild Capsicum species has been better than expected. Germination was spread over 10 or 14 days, with the resulting seedlings being small and delicate, but the end result is definitely encouraging. C. lanceolatum was a worry as the first seedling to emerge was extremely small and looked quite unlike a chilli seedling, but now that germination has reached 60% they look very uniform and I am confident that I am not cultivating weed seedlings. The more vigorous cultivars have now been moved up to 9cm pots, so progress should be quite rapid. 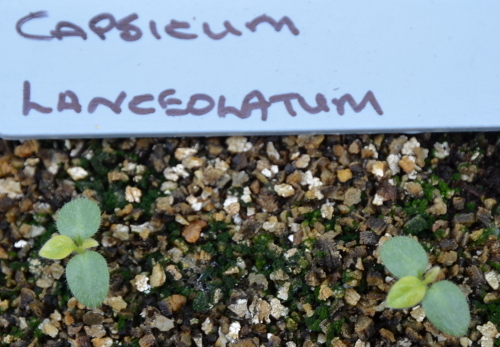 At last, only 15 days after sowing, the first Capsicum lanceolatum seedling has emerged. Now comes the real challenge - trying to raise the seedlings of the various species to maturity, and persuading them to produce ripe chillies for me to taste. The first Capsicum galapagoense seeds germinated after 16 days which is a lot faster than expected. C. eximium, which was sown 10 days later than the main trial, started to germinate after only 11 days even though it is reputed to be very slow. Germination of seed for the chilli variety trial has been fast and uniform this year. Only one variety still to emerge after 11 days, plus Capsicum galapagoense which is not part of the trial. Very pleased with the chilpetins, as I expect some good smoky flavours from them. Not enough is written about the flavour of many Capsicum species, so I will be growing and tasting as many as I can this season. As the days grow brighter and warmer, it is becoming clearer which overwintered chilli plants have survived. Capsicum annuum and C. baccatum cultivars have fared best, along with C. chacoense which must surely be the easiest of all the wild species. C. chinense varieties have again proved the most tender and not one has survived. If you choose the chilli varieties you grow for flavour rather than for compact growth, your plants are likely to need some support. I have now added a page with some ideas on how best to provide this support to ensure a long and fruitful season for your chillies. Another year, another chilli trial in the offing. The focus this year will be on a Naga cross which produced some very interesting plants in the F2 generation. Mostly a bit too tall growing, but some really good flavours and unexpectedly sweet. I shall follow up two lines, one red fruited, the other brown; if I have enough space I may also include a more compact orange fruited line. Back from a quick holiday in Spain on the Costa de Almeria. Food reasonable, but no chilli! I did not realise how much I would miss the flavour of the chillies that we use in everyday cooking. Will take a selection of chilli powders in my luggage next time. A busy time photographing, harvesting and processing chillies. Still I have found time to add the first article on chilli cultivation which I hope will prove useful. More will follow over the winter months. An exciting day tasting a hot chilli breeding line. First a piece without rib in order to get the flavour without the heat, then a piece with rib to get the full experience. It is interesting that the flavour is much fuller and more complex when the piece includes rib. We have now been to see the chilli trials at both T & M and Fothergills. A lot of interesting material at both sites, some of which will be incorporated into our own trials program. The flooding we experienced in June is still affecting crops. Our first picking of the sweet pepper Gargantua was by no means as sweet and tasty as it has been in other years. On a brighter note our breeding for a slow burn baccatum x frutescens cross is producing some fabulous chillies. Jalapeño and Midas ripe. Fresh chillies taking over from chilli powders in our cooking. We have the first ripe chillies on Zimbabwe Black, and some of our breeding lines have good looking ripe fruit. Quality testing starts soon. 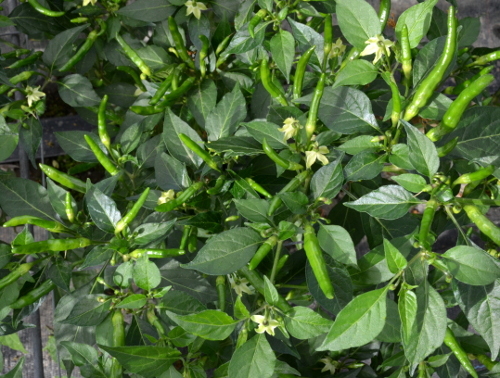 Ripe chillies on an overwintered plant of Russian Yellow. My experience of overwintered plants is that they are not always earlier than spring sown ones, but this is significantly earlier than expected. A difficult season, with very cold weather delaying planting in April followed by flooding in June. The hot spell in July caused further problems for plants which had suffered root damage in the flooding. Things are looking better now, but only two of our chillies, Chimayo and Havana Gold have ripe fruit so far. Welcome to the new Chilli Guru website. The site already contains enough information to be interesting, but will continue to grow. This section will act as a mini blog charting the progress of my chilli plants through the year.